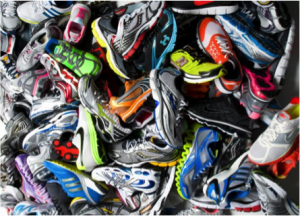 Fleet Feet Sports Madison & Sun Prairie gladly accept gently used shoes to be sent to Perpetual Prosperity Pumps Foundation in Africa. The shoes are sold in major metro areas to vendors who in turn create jobs and help improve the quality of life in cities. The vast majority of Africans cannot afford new shoes. The proceeds from the sale of the shoes provides training and tools to the poorest rural farmers. In addition to funding several life-changing efforts, collecting used shoes and selling them to locals in Ghana provides additional environmental benefits. Please Note: The City of Madison has made a change in the shoe recycling program. They have partnered with UsAgain for shoe recycling. The UsAgain program allows area residents to recycle their shoes of any kind. The shoes are shipped to Africa for reuse. They will no longer be recycled into tracks and other playground products.